When I was a was a twenty-something runner, I figured my knees would be totally shot by the time I reached age 40, and could no longer run. I was wrong on two counts. First, my knees weren’t shot when I turned 40, and now at age 49, I’ve been running a lot since. But while my knees have been mostly fine in my 40’s, it’s my hips that have given me problems. The upshot from thinking long ago I’d be done by age 40 is that every race is now is a gift. That’s still true, even though this year I’ve spent most of the time either battling hip injuries or recovering from them. 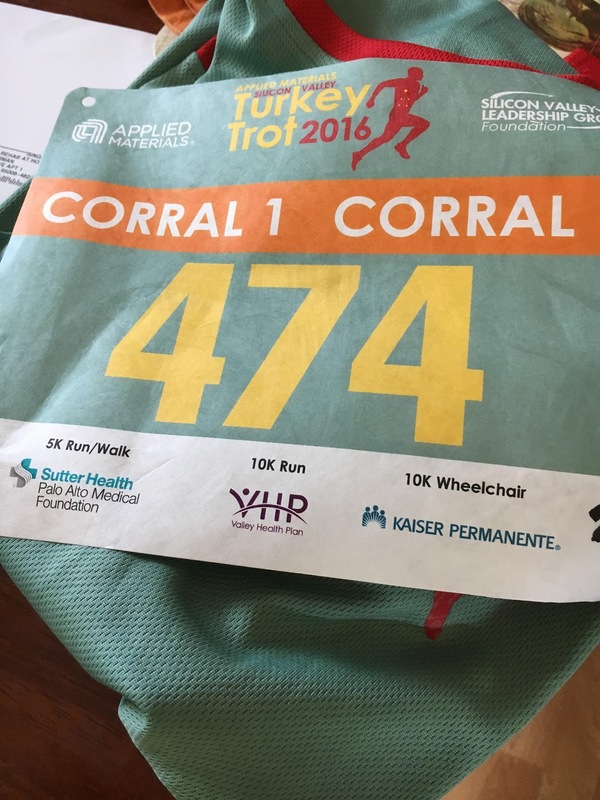 It was with this mindset that entered the Applied Materials Silicon Valley Turkey Trot this past Thanksgiving with a slightly bad wheel. My right hip which gave me problems in October’s Healdsburg Wine Country Half-Marathon had recovered some, but was still sore. The goal was just to go out, find a good pace, hold on, stay competitive, and finish strong. I wore a watch to monitor pace, but went in with no time goal. A well run race, getting the most out of your fitness level, is it’s own reward. Even with a bad hip and reduced expectations, the morning reminded me about everything I still love about racing. The nervous anticipation building up to the start. Being a part of the surge of humanity released by the “Boom!” of the starting pistol. Running in the tightly packed herd, punctuated by foot strikes and heavy breathing, in the early miles. Finding ways to overcome the doubt as fatigue sets in around the halfway point. The battle towards the end and the fight all the way through to the finish line. The post-race comrade of strangers who all just experienced their own personal journeys through the course. The feeling of accomplishment after giving just about everything I had. All of that happened one more time. I figure I’ve run well over 350 races over 36 years in my life, and while a lot has changed over that time, a lot has also stayed the same. I’ve never grown tired of it. In fact, as I get older, I appreciate it even more. So this past Thanksgiving was time for giving thanks for a lot of things, and being able to race once again was a big part of that. Next Next post: The Session #118: Who’s Coming to My Ultimate Fantasy Beer Dinner?